I love to make up some special treats for the neighbor kids for Halloween. 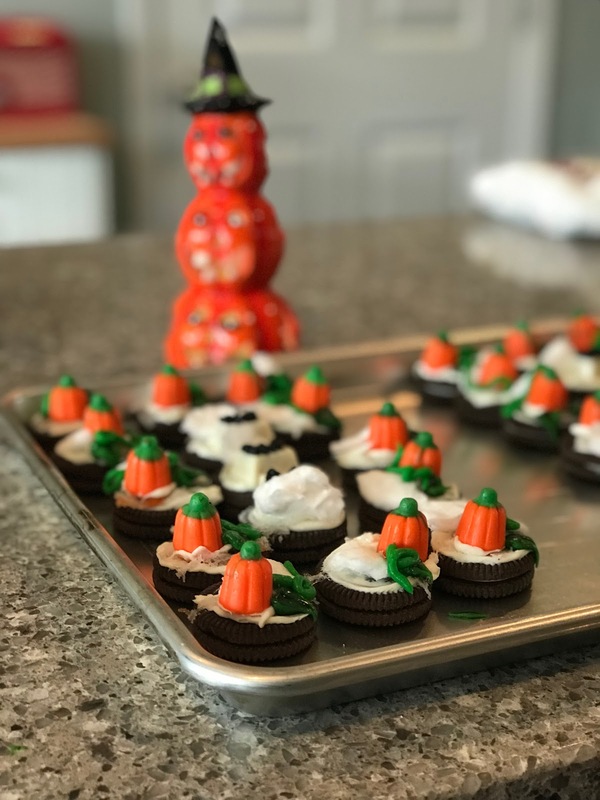 Halloween Chocolate Sandwich Cookies are adorable, inexpensive and easy. Since their parents know me, they are assured that the treats are safe and made in a clean kitchen. In this day and age, I wouldn't make treats for kids I don't know personally. When I was a little girl, my parents bought us chocolate sandwich cookies for after school snacks. It was considered a special treat and not something we got every day. I don't remember my mom or grandmothers decorating them but I still remember the special feeling of sitting down after school with a tall glass of milk in a purple aluminum glass with three sandwich cookies on a napkin. That milk was the coldest milk I ever drank! A fun way to serve up a plain sandwich cookie! Open all the bags of ingredients. 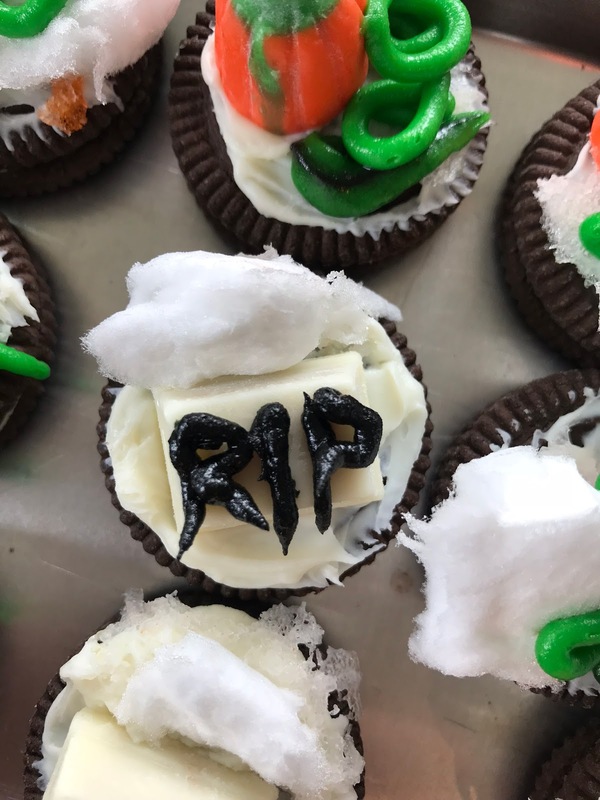 Open the icing and screw on the leaf tip on the green and the writing tip on the black. Stir the container of frosting. Spread a small amount of vanilla icing on each cookie. Place a bit of icing on a pumpkin and place it on top of the cookie. Repeat until 1/2 of the cookies have a pumpkin. Place a bit of icing on the mini Twix bars and place it on top of the cookie. Repeat with the remaining half of the cookies. Tear a one inch piece of cotton candy and place it by the pumpkin or Twix bar, to resemble fog. Repeat for all cookies. Using the black icing write RIP on the Twix bar. Repeat on all Twix bar cookies. 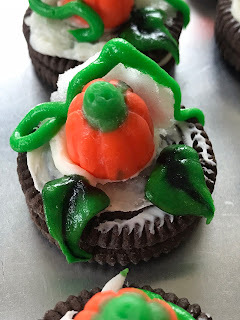 Using the green icing, make leaves on each pumpkin. Rinse the writing tip from the black icing and place it on the green icing. Make vines across the pumpkins. Let air dry until icing is dry to the touch. The cotton candy melts pretty quickly but leaves a pretty web like effect.